BB Cream was originally developed in Germany in the 1950s. "BB" is short for Blemish Base, Blemish Balm or Beauty Balm Cream. It was used on the wounds of patients who had laser surgery to heal the scars faster. In addition to helping wounds heal, the cream also provided a light coverage to the skin to help hide scars.The trend then spread to Korea, Japan, Southeast Asia, the rest of Europe, and finally, to the west. 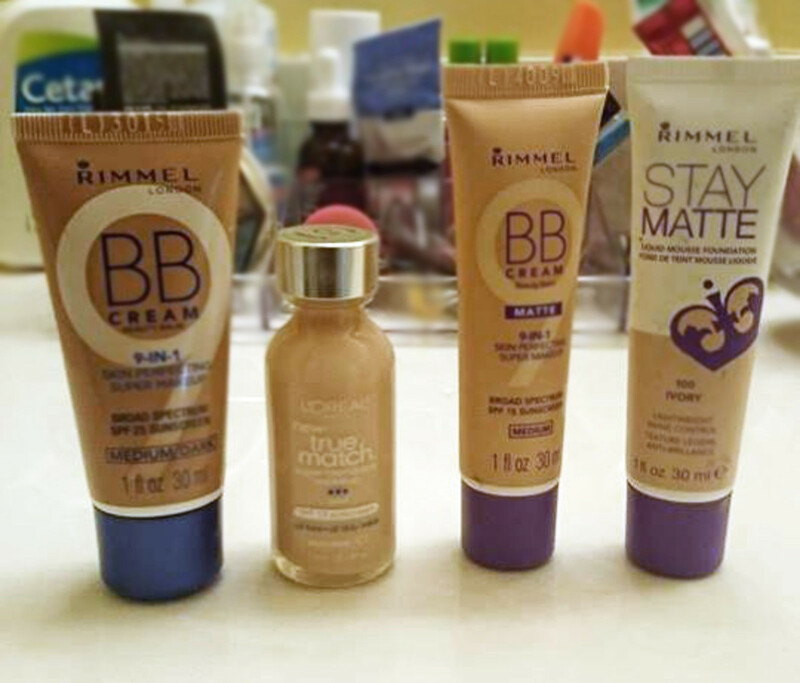 The market exploded with these BB creams just a few years ago and by the end of 2014 every major high-end and drugstrore brands had their own BB cream, and some brands even created an entire line of BB creams such as Rimmel London and Maybelline New York. BB Cream provides coverage, like a foundation, but the coverage is usually sheer, more closely similar to that of a Tinted Moisturizer. The cream also claims to have healing properties to soften, smooth, refine, and regenerate skin; we have to be careful with very vague claims like that. More on that later. 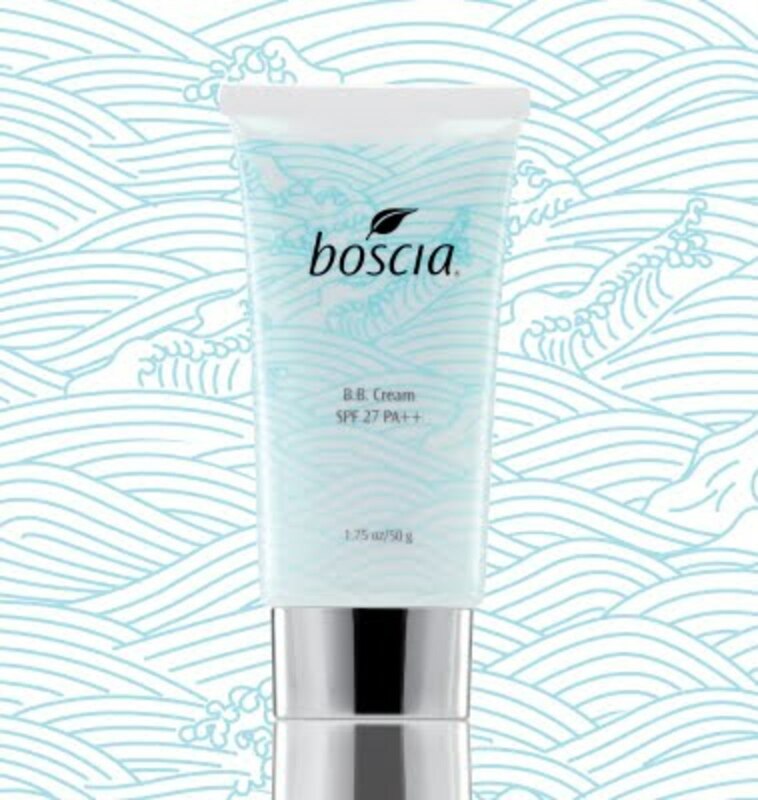 Among the other ingredients in the BB Cream were Abyssine®, Hydroprolisilane and Beta-Glucan. Not naturally found. Usually used in firming products and healing of small scars or fading of stretch marks. These are polysaccharides that are made up of only glucose linked together. They are known as “biological response modifiers” because they have an ability to activate the immune system. “This oil-free B.B. Cream is the ultimate multi-functional treatment. The gentle botanical formula creates a lustrous, flawless finish as it hydrates, firms, and soothes the skin. It helps to diminish the appearance of pores, fine lines, and uneven skintone while providing long-wearing, natural coverage that conceals imperfections. Comes in a self-adjusting, universal shade that warms to complement most skintones for sheer, flawless coverage. 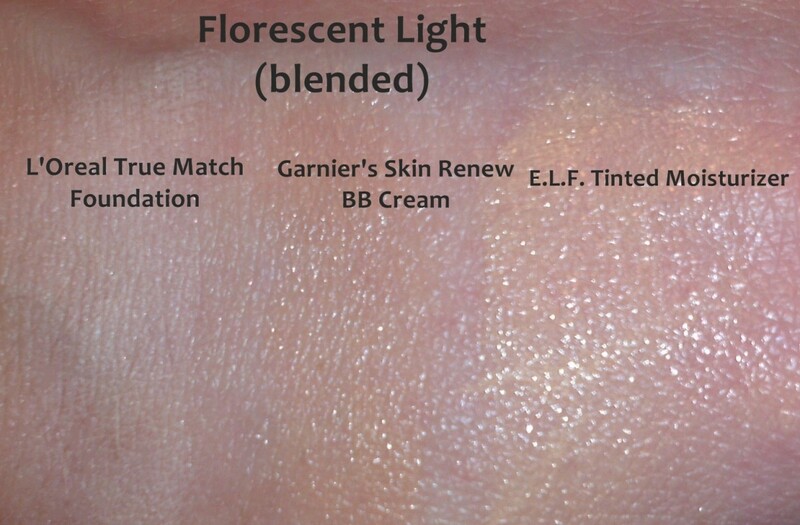 How well did the Garnier BB Cream work for you? The main difference between BB Cream and Foundation or Tinted Moisturizer is that it is designed to be a all-in-one product. 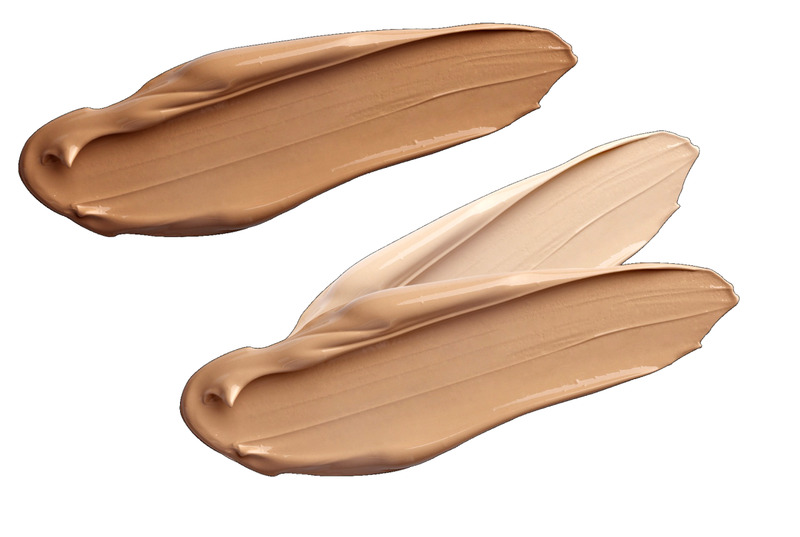 Whereas foundation focuses on heavier pigmentation to even and conceal, Tinted Moisturizer focuses on light coverage and moisturizing, BB Cream tries to focus on all of those including acting like a "medication" for your skin. The Garnier BB Cream comes in a large sized bottle compared to other BB Creams currently on the U.S. market. 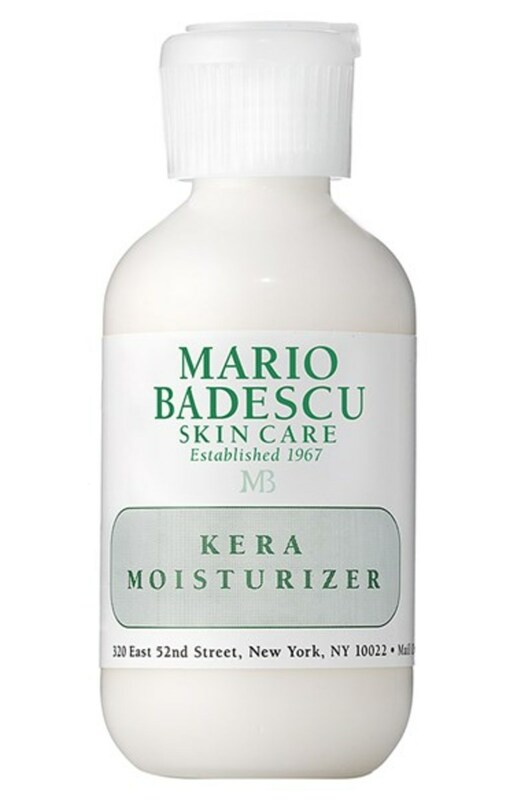 It was also one of the first BB Creams to popularize the store shelves in the U.S. If you've tried this cream, you can vote in the poll and comment below and let us know how it well it worked for you as well as see how it stacked up for others. 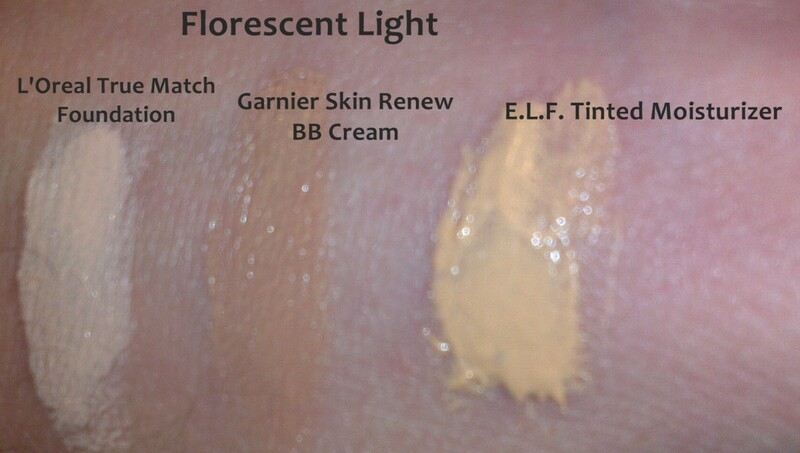 I tested out Garnier's Skin Renew BB Cream in Medium/Deep, L'Oreal's True Match Foundation in Albaster, and E.L.F. 's Tinted Moisturizer in Porcelain to see how they compare. 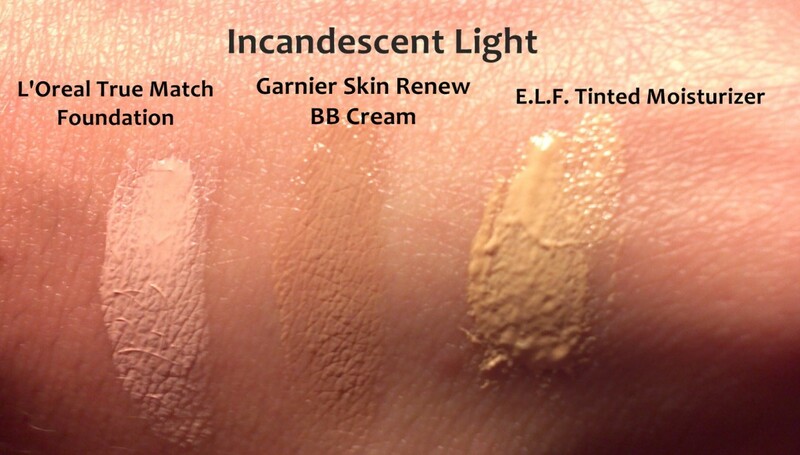 Below is how each showed up on the skin under incandescent and fluorescent lights. 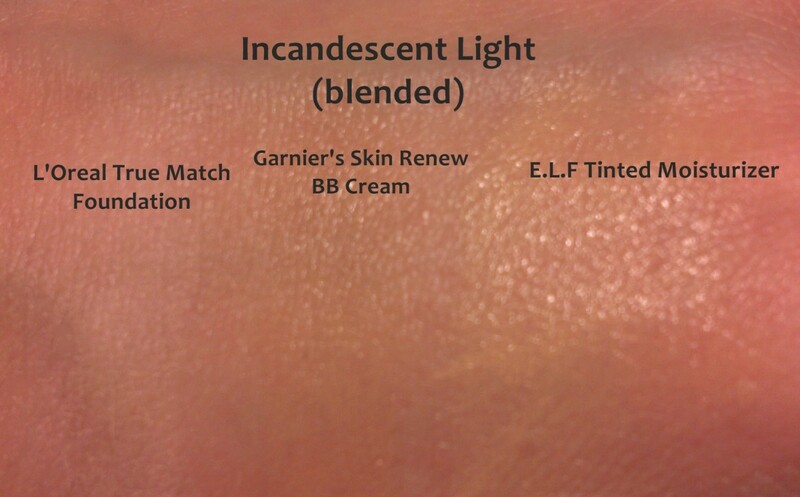 The BB Cream was most similar to the consistency of a Tinted Moisturizer. A lot of makeup artists will tell you not to waste your money on BB Cream because it is the same as a lot of Tinted Moisturizers, but sometimes even gives you less coverage than those. While I tend to agree with these makeup artists, the added benefits of the cream being an all-in-one cream, makes it tempting to try. One downside of BB Cream is the poor range of colors it comes in. 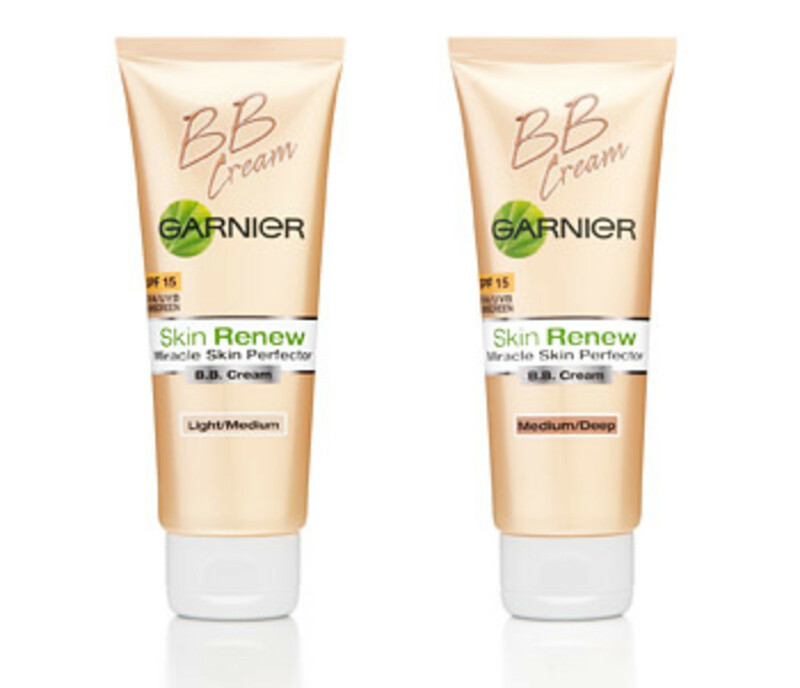 As of May 5th, 2012, Garnier's Skin Renew BB Cream only comes in two shades Light/Medium and Medium/Deep. Poor selection, but since you have to blend out the cream well and it doesn't provide a lot of coverage anyway, it won't look like much of a difference in skin tone. As always, it's best to try out a sample beforehand at a professional makeup counter, from online samples, or just a "buy-try-and-return" from a store with a good return policy, to make sure your skin will not react adversely too all the ingredients. 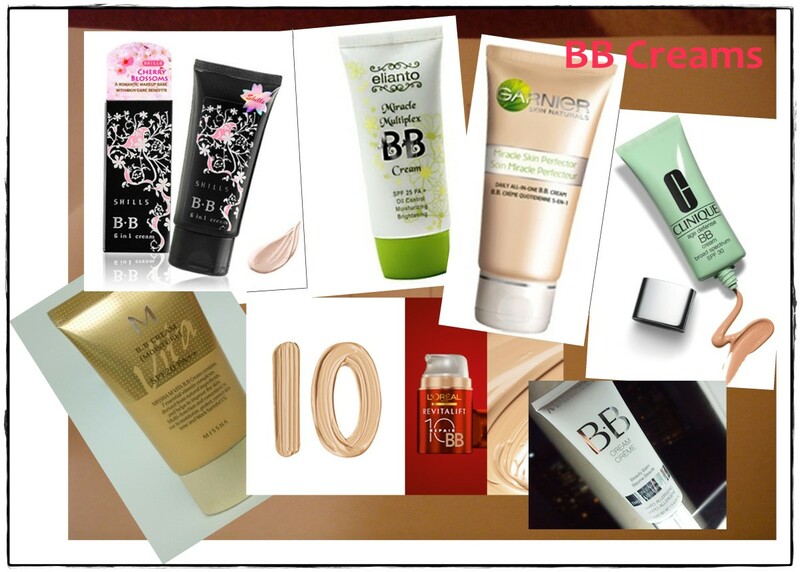 BB Creams from Asia tend to provide a lot more coverage and the overall public opinion is that Western BB Creams are nowhere near as well-developed and good as the ones in Asia. With that said, in order to narrow down your options, ask yourself some questions about your skin tone. Do I want a matte or dewy look? 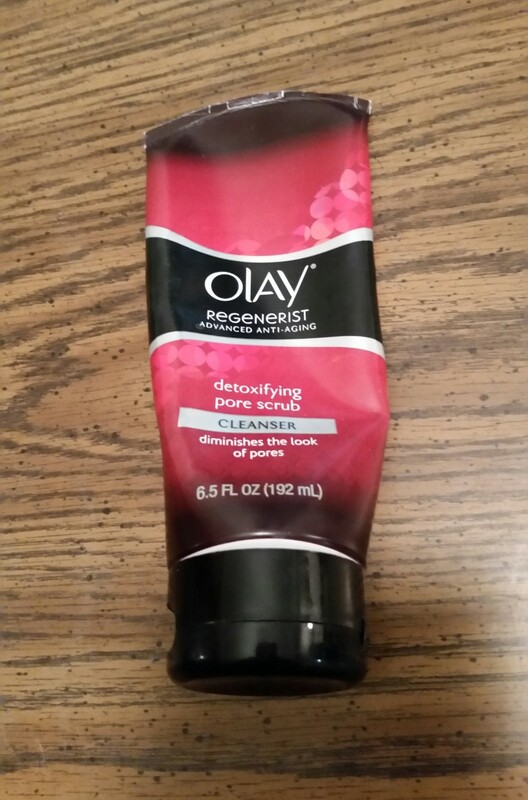 What type of skin do I have, oily, dry, or combination? What is the main thing I want my BB Cream to do? Your answer should tell you what type of BB Cream you are looking for. For example, I need a matte BB Cream for oily skin that will give skin a toned appearance. From there, narrow down your choices by reading online reviews and informing yourself. Here are the top 10 makeup mistakes women make when applying their makeup. Learn how to avoid these. 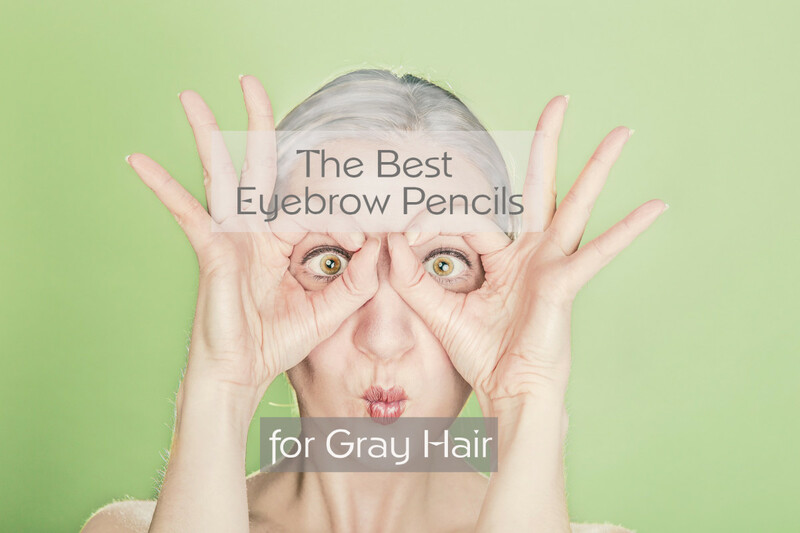 Here is a list of essential makeup and cosmetic items that a lady should always carry with her, as well as some extras to add in as the seasons shift. Here is a simple and easy to make DIY homemade facial scrub that you can create using basic ingredients. What do you currently prefer? If you enjoyed this article, please remember to share it. I was really wondering about BB creams too. 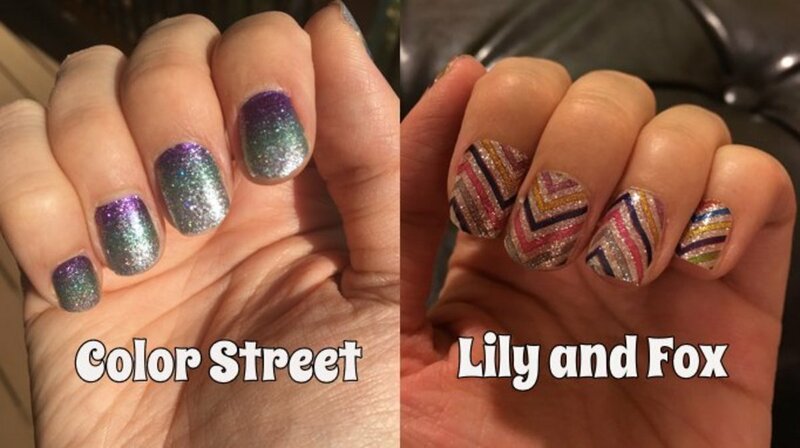 I have used three different ones and I find that they really vary...I have a very definite favourite! Interesting hub thank you! I'm so glad you wrote this. 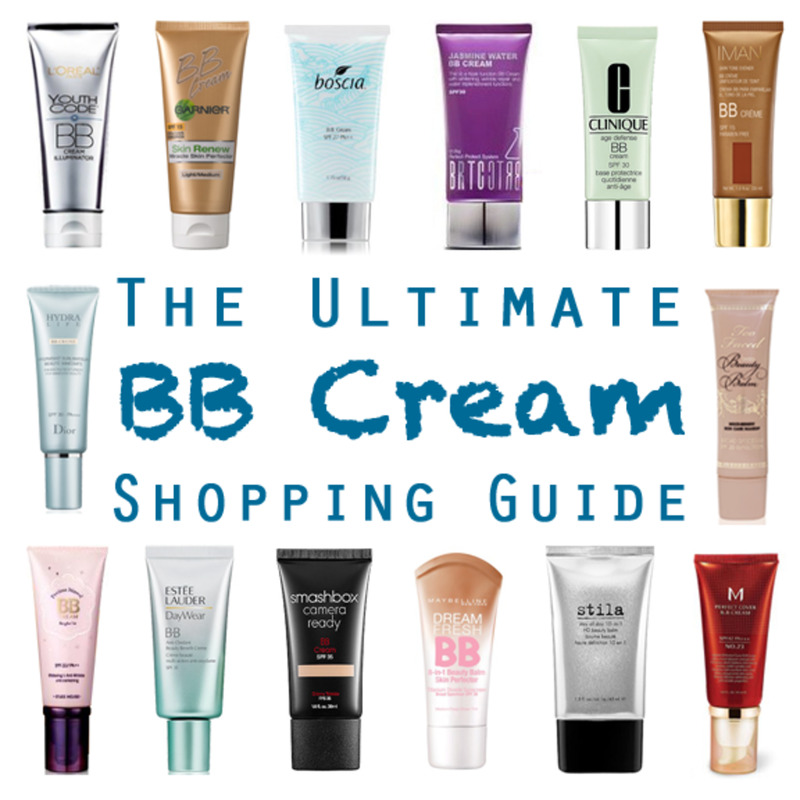 I was wondering what BB cream was. Now I'm informed, thanks to you. I won't be making that purchase. They wouldn't have my skin tone. Well done.